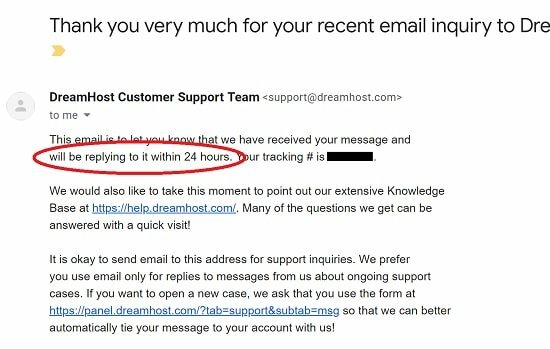 Good hosting support is hard to come by. All providers promise you the moon and the sky, talking about their “Award Winning Support”, and how they have representatives working around the clock just to help you. At the same time, these providers will have hosting plans at such low prices, that make such claims financially impossible. However, none of these web hosts provide the cheapest services. Why? After a certain point, the most expensive part of web hosting isn’t the servers, or the quality of the hardware. It’s not the technology, or colocation costs. It’s the support. The human element. It’s something that scales linearly with your business, unlike technology which can handle things at scale without linear costs. Many providers have specific times at which you can obtain live support via phone or chat. This is not surprising, since it costs a lot to have support outside office hours, during downtime. And since a lot of web hosts don’t have international customers, they view it as a waste of time to have support outside regular working hours. The best hosting support companies however, will have 24/7 live support with either chat, or e-mail. Not all issues can be resolved quickly over chat or the phone. Sometimes, a more serious issue crops up, that requires detailed investigation. For these situations, a ticketing system is necessary, with a tracking number. That’s quite a long time to wait! Of course, you’ll often receive a response in less than the promised time. But providing a guarantee is important. Hosts with excellent customer service will guarantee quick response times for tickets. Liquid Web is particularly noteworthy here, since they have a compensation system for tickets that exceed the response time. See below for more. 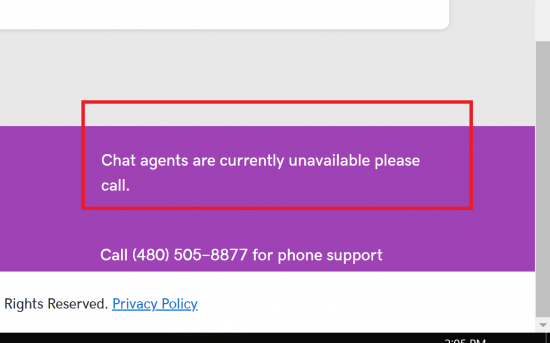 Many web hosts are realizing the importance of having support representatives that speak the same language, with the same accents as their customers. However, this costs a lot more when the customers are US-based, due to the obvious differences in wages. The difference in speaking can even come across in live chat. Call centers try and train their employees to mimic accents and phrases of customers abroad, but it rarely works. You can always make out that the person at the other end isn’t a native speaker. So excellent hosting support ensures that customer service is provided by native speakers in the same language that the customers use. Having customer reps with a decent knowledge about web hosting and the various applications that run on them is expensive. These non-suggestions are the equivalent of a computer support guy from BestBuy telling you to reboot your computer. And if they can’t resolve the issue, they’ll shift the responsibility to the “real” tech support guys who take time to get back to you, and to whom you don’t speak directly. Top quality support doesn’t do this. The ticketing systems, phone, and chat lines are manned by people who know their stuff. People who know how to type commands into a terminal. People who know about WordPress, PHP, plugins, SSL, and other server internals. Not glorified receptionists. If a web host oversells its servers, you can be sure of trouble. It means their individual plans are extremely cheap, and they make up in volume, what they lack in margins. Most hosts are not transparent about overselling. This means their support lines will be overburdened. And not just because there are lots of customers. The support staff will be facing constant complaints of slow speeds, and other problems that arise from overselling. RoseHosting stands out in this regard. They’ve always placed a premium on low-density VPS servers, ever since 2001 – see below for more. So now that we know what constitutes good support, here’s a list of 3 web hosting providers whom I feel provide the best overall support. Out of all the “starter” web hosting companies, I believe SiteGround provides the best support. When I say “starter”, I mean web hosts will traditional shared hosting, with a price range of a few bucks a month. Here’s the SiteGround pricing for all their hosting plans. As you can see, SiteGround is more expensive than other companies like Hostgator or Bluehost. In fact, I’ve often called them the “Apple” of the hosting world. 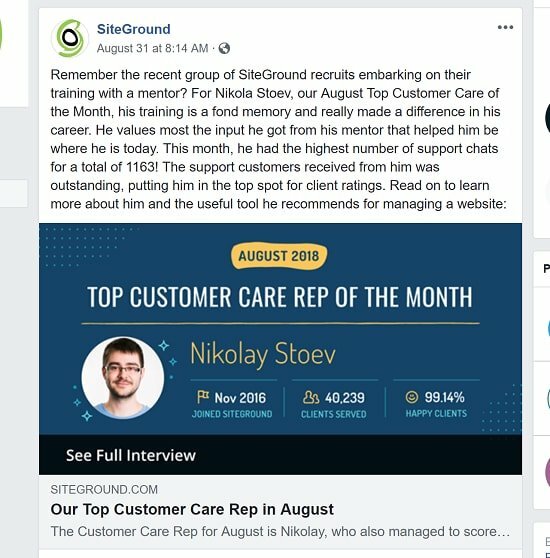 What makes SiteGround support better than the rest? Unlike other providers in the same price range, SiteGround has live chat around the clock. Not much wait times, and knowledgeable staff. I’ve personally used them for years, and they’ve always managed to resolve my problems almost immediately. While there’s no information about guaranteed ticket response time, SiteGround has repeatedly shown that they address tickets in under 10 minutes on an average. That’s a very impressive level of support! RoseHosting is less well known than SiteGround, and their main focus is on VPS hosting – both pre-made, as well as customized. Here’s a list of RoseHosting prices for all their plans. Unlike SiteGround, RoseHosting doesn’t have servers all over the world. As a result, they’ve managed to keep all their support staff within the United States. No outsourcing. That’s a plus point for me. This is particularly impressive considering that their staff is located in the US. It means they’re reachable at all times of the day and are not skimping on costs. RoseHosting’s statistics of less than 5-minute response time for tickets is very impressive. Given that their support is US-based, it’s all the more impressive. Unlike SiteGround, which doesn’t provide root access to its servers on the GoGeek plan, RoseHosting’s managed VPS solutions, give the user full control, including root access. This means that their support staff has to deal with more complex problems, as it’s easy to mess things up. Right from 2001, RoseHosting was the first to introduce virtual Linux servers. At that time, they promised to not have more than 15 virtual servers on a single machine. And they’ve maintained that focus on keeping low-density servers even today. It’s one of their major selling points. Liquid Web is one of the more expensive providers on my list. In fact, they realized early on that they couldn’t continue providing a high level of support with cheap hosting plans. So they got rid of their shared packages entirely! Now they only focus on high-end hosting, with managed WordPress, WooCommerce, VPS, and cloud services. Here’s a list of Liquid Web prices and discount coupons. Liquid Web is unique amongst hosting providers, in that its SLA gives a lot more compensation for downtime on their servers compared to anyone else. 10 times to be precise! Also, they promise 100% uptime – not 99, or 99.99%. Given that their hosting is much more expensive than regular providers, it’s a very solid guarantee of uptime, and support. Given Liquid Web’s premium prices, it would be surprising if they didn’t have top of the line, round the clock support. This includes chat, phone, and ticketing. Liquid Web’s support staff are tier 3. This means that you always get the most knowledgeable individuals to help you out with your problems. No more getting asked to check whether or not the router is switched on! Tier 3 tech support is expensive and forms the basis for Liquid Web’s high prices. And when you take into consideration their 24/7 availability, it makes it all the more impressive. There are other web hosts that provide excellent customer service. But not many of them can deliver round the clock live service, that’s locally based and qualified. These three web hosts are the best in their class, based on my judgment. I’ll update this list if I find another web host that satisfies my criteria!